Name a star for a loved one! Buy a unique gift for birthdays, graduations, weddings, anniversaries, Christmas, Valentine's day, Mother's day, Father's day or for other special occasions. 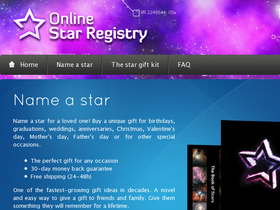 Online Star Registry is a unique and thoughtful gift for someone you appreciate. When you order a star kit from Online Star Registry, you get a star kit gift package sent either to your home or directly to the person you are giving the gift to. Online Star Registry will even include a gift card to introduce the recipient to what they are receiving and who has sent it to them. Before naming a star with Online Star Registry visit 58coupons for best promotions, discounts and savings. Name a star for a loved one at Online Star Registry starting at only $79. Click link to get started. Visit Online Star Registry today and get a free embossed star certificate identifying the cosmological location of your star and the name you have chosen for that star with every registration. With every star registration at Online Star Registry you'll receive a free book containing very detailed color photos of various star clusters taken with the Hubble Space Telescope. Follow link for details. Name a start with Online Star Registry and get a free star map outlining the coordinates and location of the star. Click link to get started.